While the Red Sox were being honored in front of the Gillette Stadium crowd ahead of the Sunday Night Football Matchup against the Green Bay Packers, the Gold Glove Awards ceremony took place at ESPN Headquarters in Bristol, Connecticut. The Sox had five finalists—Mitch Moreland, Andrew Benintendi, Ian Kinsler, Jackie Bradley Jr., and Mookie Betts. Of the five, it was the last three on the list who took home the hardware. For Kinsler, he won the second gold glove of his career and his first since 2016, when he played for the Detroit Tigers. Kinsler’s 2018 will be remembered for his gaffe in the 13th inning of Game 3 of the World Series—but he was otherwise superb defensively this season. His ten defensive runs saved was good enough to be tied for first place with fellow finalist, Rougned Odor of the Texas Rangers. He also finished first in the American League with an ultimate zone rating—a stat that compares the outcome of a ball in play to data on similarly hit balls in the past to compare the fielder did than the ‘average’ player—of 9.7 and a UZR/150 of 9.4. In all likelihood, this Gold Glove won’t be the last award won by Betts. The likely American League MVP winner also captured his third consecutive gold glove on Sunday night. His 20 defensive runs saved placed him atop the majors among right fielders—the next closest being Mitch Haniger of the Seattle Mariners, who had nine. But we all know the defensive prowess of Betts, so him winning shouldn’t come as much of a shock. However, we also all know the defensive prowess of Jackie Bradley Jr., who entered Sunday without a single gold glove award—and never once was a finalist. Yet both of those came to an end in 2018, as Bradley captured his first gold glove of his career. His UZR and UZR/150 ratings—7.4 and 8.8—were both second in baseball to Lorenzo Cain. Justice was finally served for Jackie Bradley in 2018. 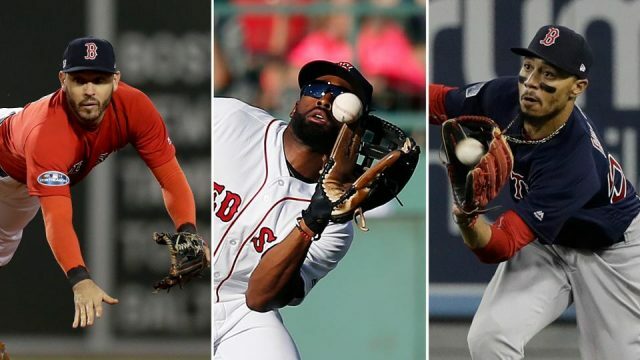 With the Gold Glove awards out of the way, now all that is likely left is the AL MVP winner, then fans can officially put to bed the magic that was the 2018 season for the Red Sox.